A great all-rounder. Your favorite and ours, the 8" Fibrox Pro Chef's Knife can handle nearly every kitchen task imaginable. “Highly Recommended” for over 20 years by a leading gourmet consumer magazine that features unbiased ratings and reviews of cookware and kitchen equipment, this Chef's Knife is preferred due to its comfortable handle, superior weight and balance, and razor sharp edge that rarely requires re-sharpening. Tested against dozens of other chef’s knives, some with price tags nearly 10 times the cost of this knife, the 8” Fibrox Pro Chef’s Knife is still the one to beat! 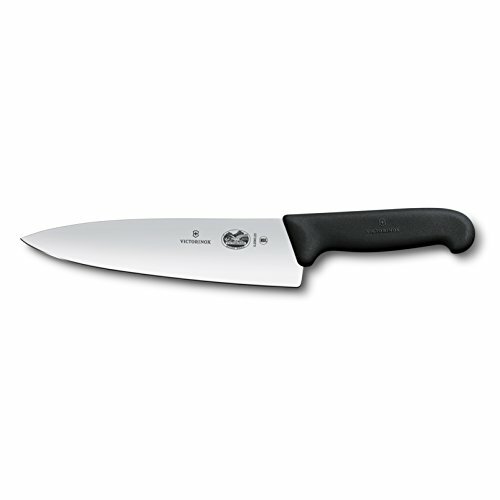 An all-purpose chef's knife is an essential tool in every kitchen. The Fibrox Pro 8" Chef’s Knife is optimally weighted with high-quality, lightweight European steel that reduces hand and wrist fatigue, making it feel less like a knife and more like an extension of the hand. Perfectly suited for dicing onions, mincing shallots, chopping herbs, crushing garlic, slicing meats of all varieties, and shredding cabbage, its versatility will quickly make it your go-to knife. At 8", this knife offers the heft needed to complete larger tasks effortlessly, while still allowing for perfect maneuverability on smaller tasks that a larger, bulkier knife may not be able to accomplish as easily. The overall shape of the blade, with a long, sloping curve, lends itself to “rocking” very well, allowing one to mince and chop with ease, while the flat spine allows you to comfortably press down on the blade when extra power is needed to slice through hard-skinned items like acorn, or butternut squash. The ergonomic, non-slip patented Fibrox Pro handle was designed to minimize wrist tension while providing a secure, comfortable grip no matter the size of your hand or where you are gripping the handle. Both lightweight and durable, the textured handle offers perfect balance and feels secure even when greasy or wet, allowing for precise and effortless cuts every time. For all of these reasons, Fibrox Pro cutlery has been the choice of culinary professionals for decades, and also due in part to the fact that it is hygienic and dishwasher safe. The National Sanitary Foundation (NSF) certifies that this product is made to the highest sanitary standards, so you can cut with confidence. Whether a seasoned, or novice home chef, Victorinox Swiss Army offers not only the right tools and the know-how, but most importantly, the confidence to achieve one’s culinary aspirations. Expertly crafted in Switzerland since 1884, Victorinox offers a lifetime guarantee against defects in material and workmanship. Please NOTE that this item ships with the International item number 5.2063.20 on the blade and not 47520, 40520, 45520, or 47520.US2, but is the same 8" Fibrox Pro Chef's Knife. In 2011 Victorinox began marketing all its product lines, including kitchen knives, under the common umbrella name by which the company is now popularly known – Victorinox Swiss Army. For optimum performance, knives should be honed after every couple of uses. Proper and frequent use of a honing steel will keep your knives sharper and performing at their best, but remember that a honing steel will not sharpen a dull knife. Honing steels are maintenance tools and are used to help keep an already sharp blade from degrading. During use, a knife edge becomes rolled or turned from direct contact with cutting boards, bones or other hard objects. In this case, honing is necessary to straighten the edge of the knife. After significant use, the steel particles become damaged and the edge cannot be brought back by honing, so sharpening is necessary. If your knives are dull, pitted, or you see visible nicks on the cutting edge, you’ll need to sharpen with a Swiss Sharp Handheld Sharpener (49002) or bring to a professional for re-sharpening. In 1884, Master Cutler Karl Elsener opened a cutlery shop in Ibach, Switzerland. There, he and the cutlers’ union he formed produced the finest steel cutlery, finished with the now-famous proprietary edge preferred globally by professional and home cooks. In 1891, Karl supplied the Swiss Army with its standard issue Soldier’s Knife and in 1897 with the Officer’s Knife. In 1921, after the death of his mother, Victoria, and with the advent of stainless steel, then known as “inoxydable” and used in the production of his cutlery, Karl changed the name of the company to Victorinox. It is from those humble beginnings that a worldwide icon was born. Cook's illustrated winner the best and a bargain 8" chef's knife item number 47520 (Consumer packaging number), 40520(Commercial Bulk Number), or 45520(Amazon Frustration-Free Packaging) are the same knife with swiss item #5.2063.20 printed on the blade. Patented 2-inch Fibrox handle is textured, slip resistant, and ergonomically designed.